Published March 5, 2014 By Leisa Good This post may contain affiliate links. Regardless, I only recommend sites I've researched and/or used and trust. Would you like to work online for a travel company? Did you have experience booking travel? Do you like receiving travel discounts? Then signing up for Carlson Wagonlit Travel online might be a good work from home job for you. 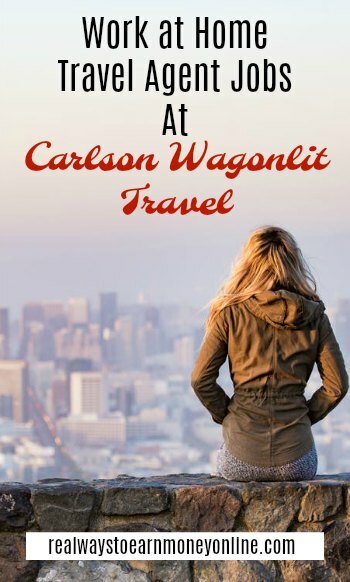 What Exactly is Carlson Wagonlit Travel? Carlson Wagonlit Travel, also known as CWT Netherlands, has been allowing agents to work from the comfort of their homes since 2008. Named the Most Admired Travel Management Company globally as well as the recipient of the TelewerkJaarprijs 2010 “Telework” award for its Work@Home program, Carlson Wagonlit Travel prides itself on offering a solution to work-life balance. Once hired, your home office will need to be set up according to health and safety regulations as put forth by the company. You will be working virtually, but in contact with your fellow virtual travel counselors. What Does a Remote Carlson Wagonlit Travel Counselor Do? You would be doing the same job as any travel agent would do. You would be booking hotels, airline travel, and also helping clients reschedule travel. Seventy percent of all travel decisions are made by women, so the majority of your clientele will be women needing to book travel. The term “counselor” is used instead of “agent” to promote a higher level of service. What Are the Hours and Pay at Carlson Wagonlit Travel? The hours are full-time, 40 hours a week and during “business” hours. What is the Pay and When is Payday at Carlson Wagonlit Travel? The pay appears to be around $15 an hour with payday being every two weeks. Are You an Independent Contractor or an Employee at Carlson Wagonlit Travel? Part-time positions are available and can be discussed with the hiring manager and/or your current manager. Educational assistance will need to be approved and job-related. What Skills/Special Training Do You Need to Work at Carlson Wagonlit Travel? What is My Overall Impression Carlson Wagonlit Travel? After reading about them online, I was impressed with their rating and online reputation. The benefits package is so tempting that I am almost tempted to apply myself, but I don't have any international travel reservation experience. Many travel counselors seemed happy with their jobs. How Can an Interested Applicant Apply to Carlson Wagonlit Travel's Work-at-Home Travel Counselor position(s)? Go to this link and start the process. For more legitimate work at home jobs, be sure to check out the work at home job leads board (updated several times per week), or consider getting a subscription to FlexJobs, a membership-based job site with guaranteed legitimate job postings. I really hope that any of you with experience with this company will also chime in. I was so impressed with the benefits!